I felt like I was sending my child off on a school bus for the first time. I didn’st want to part with this pallet, partially because its about 1/8 of our popcorn. It is, however, out the door and on its way to Amazon. Shipping to Amazon has not been that easy. For starters, they make receiving the product almost impossible. Sure, we can stack a pallet, shrink wrap it, schedule a pick up… but after that it gets a little complicated. Amazon has a huge set of rules. First, they would like you to use a preferred shipping carrier. Funny because the preferred carrier is about 5x as much as a normal carrier. I opted out of that one, and chose a “normal” carrier. Second, you have to schedule a delivery through a website after your shipping carrier creates an account with Amazon, and after the truck picks the order up. Once Amazon receive a schedule request, it takes them about 24 hours to get back to you. Once that happens, they give you a time. If that specific time doesn’st work for the truck driver, then they give you another option. You go back and forth until something works. Easy to do on the phone, not so easy to do over internet…. I asked to speak to a live person today, and they said, ” The reason we do this via internet is so that we don’st have to have a live person doing this… there is no one over there to answer your call.” I pictured WALLE all by himself, rummaging through piles of Amazon products. I guess once we get the hang of all this, it’ss apparently really quick and easy, but I don’st buy that just yet. 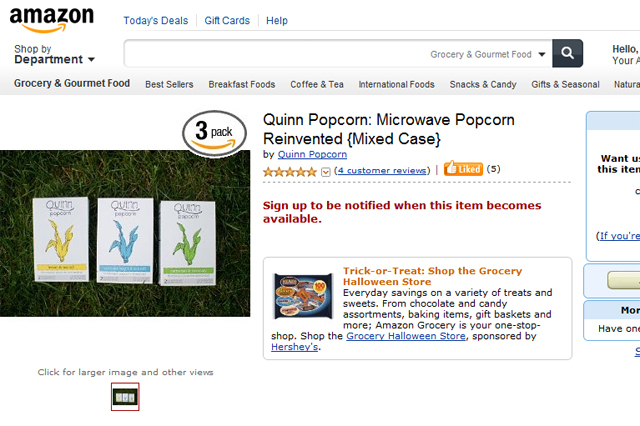 So, you are probably wondering why we are shipping QP to Amazon. We are doing it because we have purchase requests coming from all over the country, and we want to make sure Quinn Popcorn is available for those who want some! Amazon has this system in place called FBA. Fulfillment by Amazon. This means that once they receive our pallet, they will be responsible when an order is placed on Amazon and they will ship it out. Yes, this will cost us, but it will actually save us money in the end because we won’st have to do it ourselves and shipping is much less expensive. Actually, it’ss an amazing deal. Amazon takes very little for handling a lot of complex logistics. Even though getting the hand of it has been tough, their system must be extremely efficient because their costs are so low. I hope this is not a long time solution, but it’ss very helpful right now. Eventually we will refresh the website and include a purchase section. It would just be much nicer to have it all happen at our site. Will let you guys know once it’ss officially there. Should be up in a few days. Also, only the variety pack is showing now, but individual flavors will also be available. What’ss really cool, though, is that we already have 4 amazing reviews on Amazon. Thank you guys!